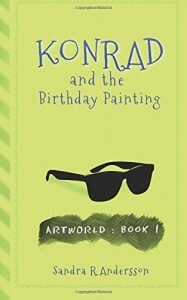 Konrad and the Birthday Painting by Sandra R. Andersson is a fun to read children's book for ages six to eighteen. I gave it four stars. This is a nice magical mystery for children. Konrad finds a pair of sunglasses that change the painting outside the principal's office into something beautiful in addition to showing what is happening throughout the rest of the school. Konrad sees Phillip, the bully that tortures him daily do something wrong. He doesn't know how to make the situation better. When he realizes that Frey, his babysitter will be blamed, he knows he has to do something, but what? How can he make people know what he saw was the truth? I received a complimentary copy from Wordbuilder & NetGalley. That did not change my opinion for this review.